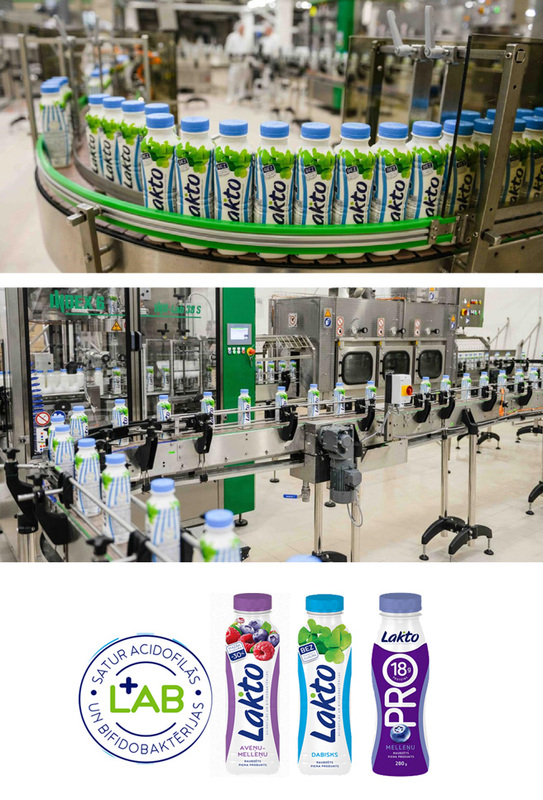 New intriguing and healthy lactic product captures Baltic markets – LACTO - a yoghurt for drinking with Acidophilus and Bifidobacteria, and a minimal amount of sugar, which is highly recommended by nutritionists to supplement the healthy daily diet and to increase immunity. The product of milk processing factory Rigas Piena Kombinats, part of the Food Union, where "Index-6" installed and put into operation a line for filling this better for you product in PET bottles. The line is Ultra Clean edition with No contact Neck handling weight technology. Line performance is 6000 per hour for 1 liter bottle. The configuration is a linear blowed 4-slot machine; Ultra Clean AssetClean™ with 12 filling valves (patented) using precision dosing weighing sensors and a closing column with 4 hysteretic capping heads. There is also a sterilization of bottles with ozonated water for higher hygiene. IND-Lab 38 S applies thermo shrinkable label with steam thermotunnel (with all safety attestations) contributes to the perfect appearance of elegant bottles. Packaging is done in group packs of thermofilm of IND-Pack 29 in different bottle configurations. The line is complete with all necessary logistics conveyors and buffer systems.